It has class list forms, checklist forms, a 12 month calendar, gift ideas for your students for both the beginning and end of the year, and line up poems. It's great for new teachers and those teachers who just want a new cute calendar! Also, don't forget to grab my new Great Graph Pack! It's packed with everything you need for graphing throughout the year! Just went and downloaded thanks a bunch! Anyway you could do a class list and check list with Ms. instead of Mrs. for us single lady teachers out here???? I would totally love it because your stuff is so so so so so cute! Thanks for sharing your hard work! Super helpful. SOOOO adorable!! Is there any way you could add a page for the "First Day Kit" that says "Smarties: You are going to learn SO much in kindergarten this year!" instead of just first grade? I would love to use it with my kinders this year! 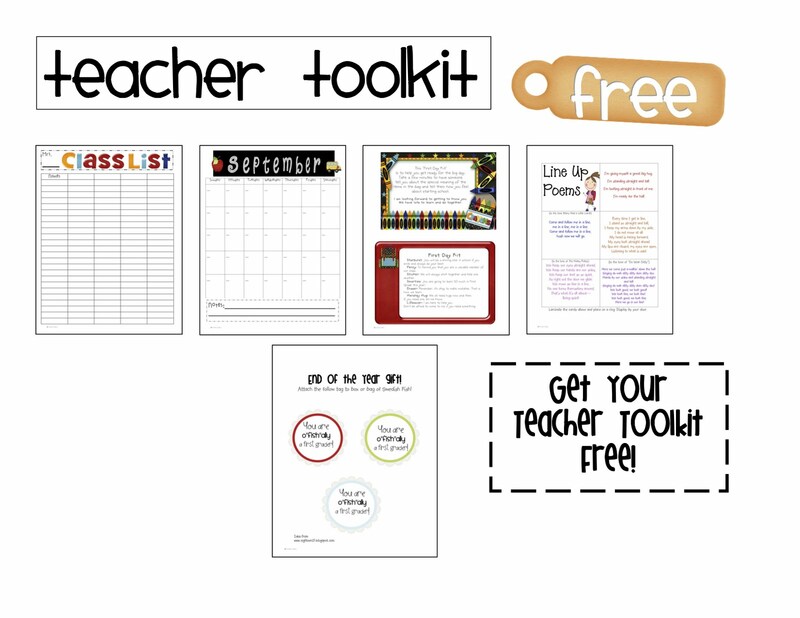 How could I download the teacher toolkit? When I click on the picture above the page it goes to is blank. There is no download. Did I do something wrong?